At the rate with which technology and robotisation is constantly evolving and replacing roles traditionally performed by human workers, the question is a valid one. Hong Kong’s property stocks are cheaper than Singapore’s, although not cheap enough to account for the risk that the world’s least affordable city could have a housing crash. SINGAPORE-LISTED companies exposed to global trade and the domestic property market could continue to do well in the latter half of 2017 after the overall market turned in a mixed set of second-quarter earnings, analysts said. ALL BUS and train commuters in Singapore will have to pay their fares with travel cards by 2020, as part of the country’s “Smart Nation” drive. Singtel has reported a 6% decline in net profit for the June quarter as a result of lower contributions from the company’s minority-owned regional associates and workforce restructuring charges at wholly-owned Australian subsidiary Optus. Singapore’s trade-reliant economy grew much faster than initially estimated in the second quarter and more than analysts had expected, with a rebound in services suggesting a broader and more balanced recovery after a stumble early in the year. Prime Minister Lee Hsien Loong will deliver his 2017 National Day Rally speech on Sunday (Aug 20) at the Institute of Technical Education (ITE) at Ang Mo Kio. 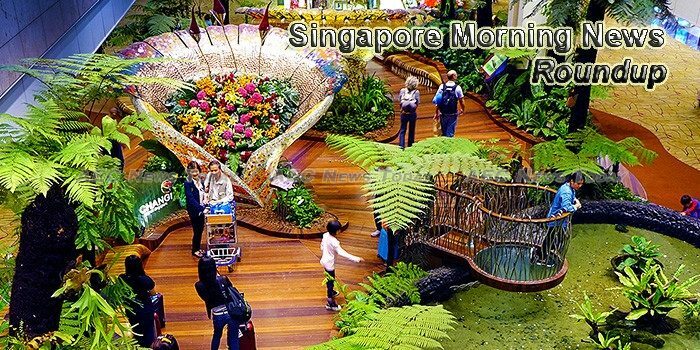 The latest index released by the Department of Statistics Singapore revealed that the city-state managed to record a 1.9 percent growth in retail sales in the month of June despite the decline in the yields from motor vehicle sales. The Agri-Food Veterinary Authority of Singapore (AVA) on Saturday (Aug 12) said eggs in Singapore are safe for consumption. Cigarettes sold in Singapore may contain less nicotine in the future, with the Ministry of Health (MOH) saying it is monitoring efforts in the United States to reduce the amount of the addictive drug allowed in each cigarette. VERY soon the humble electricity meter in your house will be having its own telecom network through which it will be able to connect to a back office and give details about your electricity usage. And your water meter may not be far behind. Both will help you save money by giving you smart information on usage. Singaporean companies risk missing out on top IT jobseekers as hiring managers take multiple months during the recruitment process. Despite this year’s strong digital push and special promotions, the Great Singapore Sale (GSS) — which ran from June 9 to August 13 — barely made an impact, according to shoppers and retailers who spoke to TODAY. The “Labour Force in Singapore 2016” report released by the Manpower Research and Statistics Department reinforces the perception that the Singapore labour force is facing long-term pressure to transform its skill base. Commuters can purchase a limited edition NETS FlashPay card from Tuesday (Aug 15), as part of SMRT’s 30th anniversary celebrations. The Migrant Workers’ Centre (MWC) on Sunday (Aug 13) said it would be urging local authorities to take “stern action” against an employer after observing hygiene and safety lapses in workers’ dormitories run by him. SINGAPORE fintech hub Lattice80 plans to open an office in India by the end of next month, the first step in a global expansion that will spread to London, New York and the Middle East. By 2035, the Asia-Pacific region is set to account for over three billion air passengers per year, boosted by Asia’s rising middle class. Singapore’s great port migration – which has major implications for the shipping and real estate sectors – has crossed a milestone ahead of schedule. An earthquake of magnitude 6.5 struck west of Indonesia’s island of Sumatra on Sunday (Aug 13), the United States Geological Survey (USGS) said. Thirty-nine people were stranded for more than four hours on the Tiger Sky Tower ride at Sentosa on Saturday night (Aug 12). While the high-level, national messages of SGSecure have been effective and well-understood, there is a need to make the anti-terrorism movement relatable at a community level, Minister in the Prime Minister’s Office Josephine Teo said yesterday. Nearly six years after it opened, social enterprise Food For Thought has closed its largest outlet at the Singapore Botanic Gardens after failing to secure a new lease for the space. Frequent flyer Jiamin Han took to Facebook to complain of several red bed bug bite marks on her arms and back that she noticed after taking a round trip flight between Singapore and Hong Kong via budget airline Scoot. Singapore envoy to Myanmar Robert Chua today called upon all elements of Myanmar society to work for a consensus on the road ahead for the country.